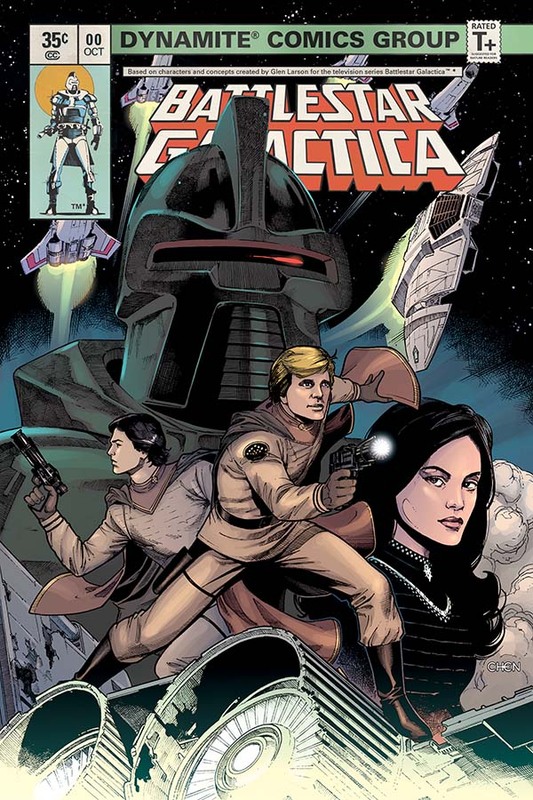 Battlestar Galactica: Classic #1 Review – AiPT! The last remaining humans flee across the gulfs of space where danger waits at every turn. To my shame I never embraced the sci-fi original series that was Battlestar Galactica, nor its successful reboot series. The basic concept, though, always intrigued me. It was about a Noah’s Ark full of humans fleeing a hateful tide of killer robots in the last spaceship, the Battlestar Galactica. Sadly I grew up a fan of more visible medias such as Star Wars and Star Trek. However, upon discovering that Galactica was celebrating its 40th anniversary this year and that the legendary John Jackson Miller was acting as lead writer? Well, as a certain movie villain once said, “Now you have my attention”. The last remaining humans are fleeing across the gulfs of space, chased by the unrelenting cyborg exterminators known as the Cylons. Along the way they encounter danger, new allies and new threats. The Galactica’s commander, Adama, must make choices that will either save or damn his crew to destruction. From the start the decisions made by characters are omnipresent and very relevant. Leading a species on the edge of extinction, Adama is a man whose actions carry significant weight as revealed in just the first few pages. While negotiating a safer travel route for the Galactica, Adama runs afoul of an alien race who refuse the humans permission through their territory. Adama ignores their demand out of desperation and saves his crew from the Cylons right on their heels. The aliens though, are not so lucky. This sets the tone for the rest of the issue. This is a story about desperation, survival and the choices one must make in regards to both. Appropriately then Adama is the focus of this issue. He is in turmoil as he juggles with potentially apocalyptic decisions on a daily basis. There are other characters fans will recognize as well as some new faces, but it is primarily Adama that shines this issue. Without spoiling too much, the story takes a dramatic turn barely a page after the aforementioned Cylon genocide. A new direction is presented to the Galactica crew that will likely catch fans of the original series off guard. The Galactica is given a new avenue of survival and brand new allies with which to survive the hostile universe they all find themselves in. Writer J.J. Miller teases an unpredictable yet action-packed future for the crews of the Galactica and their newfound friends. To start off, John Jackson Miller is dead on in this debut. A veteran of science fiction, Miller blends the elements of a classic space opera seamlessly with well defined protagonists and villains. What comes out is a new story that appeals to old and new fans alike. Miller obviously respects the source material and I trust he will move the Galactica in a direction befitting of a four decade old franchise. Surprisingly, despite my dearth of knowledge concerning the source material, I was not lost reading the first issue. While some references and terms may fly over the head of a new reader, this story is still very welcoming. Continuations or reboots tread a fine line between saying too little or bogging themselves down in explanation. The creative team thankfully avoids both. Daniel HDR’s artwork is also excellent this issue, tying together the ’70s science fiction vibe with a modern spin. Faces and emotions are richly detailed and it is always clear what a character is thinking and why. It harkens to Jack Kirby’s work for cosmic superheroes, except with shadier colors that play well into the tone of the story. But it can’t be perfect can it? No, it is not. Spaceships are something of a mixed bag here. Some panels portray majestic and intimidating warships; on the other hand, some panels have ships cluttered or in strange formations and this can distract from the story. Also present are occasional facial slip ups that leave characters looking awkward or overly emotional. Meanwhile on the characterization side, Adama is given plenty of time to shine as the conflicted Captain. Few other characters are given this level of treatment. The issue delves little deeper than “these guys are goods and these guys are bad”. With future issues Miller can explore his cast further but for now the story seems quite traditional (though this isn’t necessarily bad). This issue presents a solid story from a well oiled creative team and sets up a bright new future for the Galactica universe. While the surface of the franchise has only been skimmed a little this issue, there’s still plenty of mystery and suspense for whatever comes next. Battlestar Galactica offers a classic adventure story from a talented team of creators who are taking the series where no man has gone before.